those times you're not sure if you are coming or going but happy enough to be where you are. Wow! How did you click this? From inside a car? Lovely shot! Thank you so much jayantadeepa! I took the shot from inside a moving car, sitting in the passenger’s seat, with my iPhone. 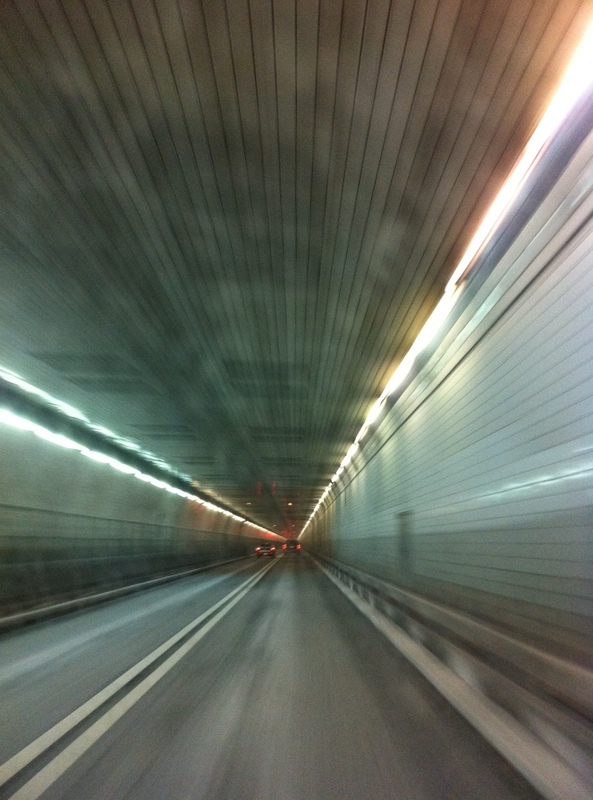 The magic vortex of the Holland Tunnel…..leading to the unreal city of New York…..always bizarre! So unreal and bizarre yet always so exciting! Do you think you will get back to NYC one day soon? Sure is….about returning …….yes ASAP! Quite disorientating I think. Nicely taken. Like falling down a rabbit hole, not that I know what that’s like . . . Your photographs are priceless… and a nice week end to you too. You are very kind, thank you Tex! Happy Super Bowl w/end to you, if you are following it at all! fantastic photo! Have a nice weekende, Patti! Thank you so much Bente and week-end wishes to you! Patti, you’ve captured the feeling I always get when driving through one of those tunnels. It has to do with an obvious lack of choice, and comes from the realization that there’s no turning back, or moving left or right. You have to keep going forward. Similar, in a weird way, to sitting on an airplane that’s about to take off. Great shot, once again. Were you driving when you took this? You have described the inverse feeling of strapping into a roller coaster ride so well Charles! I can never drive through one of these tunnels without both hands filmy gripped to the steering wheel but luckily Mr Kuche was driving so I could have fun shooting the shot! A dynamic look, in a futuristic style. Movement, speed, lights. converging lights. It’s our world, for sure there will be a light at the end of the tunnel. These tunnels have a trajectory all their own don’t they! Thank you so much Robert! I remember my wife and I staying at the Days Inn in Northbergen, NJ, and bussing into NYC each day through this tunnel. Our week in NYC was one of our best trips. You have a great weekend too, Patti. Hope you and your wife get to come back soon Allan! That is quite a unique photo idea! Looks like you were going warp speed! It’s like leaving the birth canal and arriving in Wonderland. Surreal. Mesmserising. No wonder people crash due to lapse of concentration. Glad you didn’t! Have a wonderful weekend too, Patti! Great shot by the way, so futuristic and dynamic. You simply did a perfect example of how important it’s having a motif and not just the camera. The week-end here is over. Monday morning and first coffee. We went through double lane tunnel yesterday. A moving experience with trucks thundering next to me just a couple of feet away. I grip the steering wheel praying for some daylight. The end of the tunnel can’t come quick enough. Phew.We made it yet again. Perfect shot and timing .. love the way you captured the two cars … coming and going. This jumped off the page, Patti! Superb image. Extremely compelling. You are very kind, thank you so much Karen!